﻿London's newest brewpub opened last week. The Brewhouse & Kitchen Highbury is a sibling to the B&K Islington, and it too returns to the city a lost brewery: in this case the brewing kit was formerly in the Lamb in Chiswick. 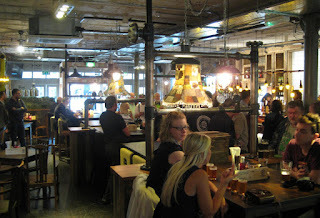 On our visit, which was officially a preview for the new format, the pub had just reopened after a six-week refit. 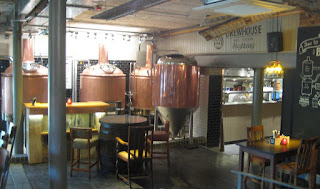 The brewkit had not yet been connected up, but it should be up and brewing now in the hands of Pete Hughes who has moved up from B&K Islington. The ales were still flowing for the preview though, Pete having brewed six of the recipes designed for Highbury on his other brewkit, and the kitchen was open too, serving excellent bar snacks. It's undoubtedly an attractive venue, done up in a sort of industrial chic style, with a long side bar, a decent sized terrace out front, and a more open space inside at the back, in front of the brewkit. Talking of which, I hope Pete has more fermenters somewhere, as I didn't see enough! The beers we tried were good, although a couple seemed a bit thin and might benefit from a little more development. I'm sure this will sort out with time and more brews. As elsewhere, the beer names are locally themed, several for the nearby Highbury football ground but others for historic local residents. Best of the lot for me were the Illustrator Black IPA, named for Charles Dickens' illustrator, who was local, and the No.19 Brown Porter, named for the nearby bus route, but the Goalscorer Session IPA also scored well. As well as eight handpumps there's a bunch of keg fonts, currently mostly for foreign non-micro lagers as far as I could see, but I know they plan to brew lagers on-site too. B&K also carries a decent range of bottled beers. I used to live just up the road a few decades ago, and my, how the area has changed. But if I lived there still, I could well imagine this place being one of my top locals. As a bit of background, the B&K story is an interesting one: the company was formed by Simon Bunn and Kris Gumbrell, two of the directors of Convivial, a small pubco which ran several London pubs, including two gastro-brewpubs, most notably the Botanist on Kew Green which pioneered the format under its then manager Mark Wainwright. While Convivial sold out to M&B, which promptly ripped out the breweries, Kris, Simon and Mark had other ideas: they wanted to take the gastro-brewpub concept and grow it outside London. They now have half a dozen sites around southern England, with the most recent being Bristol (where I believe Mark is now brewing) and Highbury. I hope this will shows a triumph of long-term vision over short-term expedience and greed; time will tell. Will there be more in London? Simon was a little pessimistic when I asked: "Brewpubs are the future, but it's hard to get good sites at a reasonable price in London, which is why we've done more expansion on the South Coast," he said, adding that the next planned openings are two sites in the Bournemouth area.